I'm looking for net lights with brown wire to set off my trees for a party. Can you help? Yes! Our customers have been requesting brown wiring for decorating their trees. We are excited to add them to our product line. 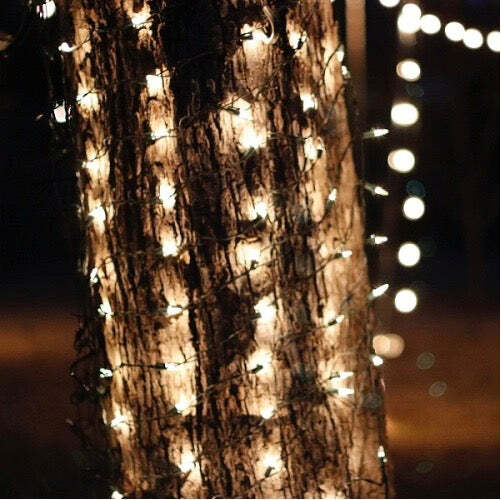 These tree trunk lights are 6 feet tall by 24 inches wide so you can tailor the quantity of nets you order to the diameter by dividing your tree's diameter in inches by 24. If you are looking for different colors for your trees, you can wrap your tree trunks with standard mini lights but using these light nets will be super-easy to install if you need white (clear) lights to add sparkle to your garden. Q: I'm wondering if people layer these nets on top of each other? Can this be done? A: We've not heard of anyone layering these lights so far but there is not anything that would keep you from doing that if you wanted a really concentrated installation. Keep in mind the total wattage of the installation, that you can't run more than 3 sets together and make sure you don't exceed your breaker rating. If you really want a concentrated look, you might consider using LED light strings and winding them really close together. Hope I've been of some assistance, let us know if you have other questions. Q: Do you sell Tree trunk Christmas battery lights for 13 trees or any battery lights for tree trunks? A: Sorry, we don't carry a net this large that is powered by a battery. The high number of bulbs have a pretty high current draw and would drain an battery pretty quickly. We have had folks who needed to wrap trees in NYC where there can't be any cords across the sidewalk use our 12 volt battery lights strings and a car battery that they recharged during the day. You'll have to wind them around the tree but this might be a solution for your project. Thanks for your question, let us know if you have others.